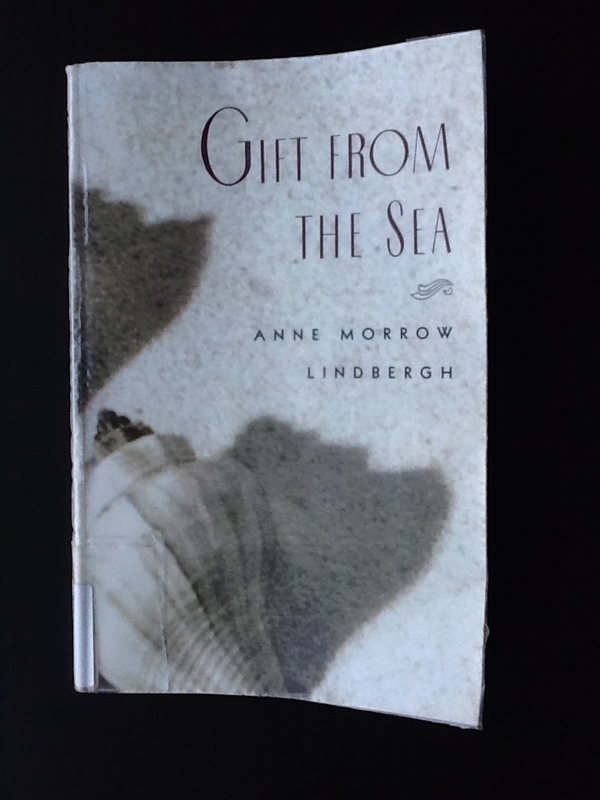 Gift from Anne Morrow Lindbergh – The Bookshelf of Emily J. Because I recently read The Aviator’s Wife by Melanie Benjamin for the Literary Wives series, I wanted to learn more about the protagonist, Anne Morrow Lindbergh, wife of famous aviator Charles Lindbergh. I was impressed that she was a writer and that she had published, in her own right, some great books. The most popular, well-known, and well-loved of those books is Gift from the Sea (1955). It is a short but poignant book of her musings at the beach alone, and how the shells she collects reflect and embody a woman’s life and its stages. Today, rather than write and write and write about all of these ideas and my thoughts on them, I will just share them with you. I hope you find a connection to them as I did. “I think best with a pencil in my hand” (p. 9). “I had the feeling . . . that my experience was very different from other people’s. (Are we all under this illusion? )” (p. 9). “Patience, patience, patience, is what the sea teaches. Patience and faith. One should lie empty, open, choiceless as a beach—waiting for a gift from the sea” (p. 17). “I want first of all—in fact, as an end to these other desires—to be at peace with myself” (p. 23). “For life today in America is based on the premise of ever-widening circles of contact and communication. It involves not only family demands, but community demands, national demands, international demands on the good citizen, through social and cultural pressures, through newspapers, magazines, radio, programs, political drives, charitable appeals, and so on. My mind reels with it. What a circus act we women perform every day of our lives. It puts the trapeze artist to shame” (p. 26). “This is not the life of simplicity but the life of multiplicity that the wise men warn us of” (p. 26). “One learns first of all in beach living the art of shedding; how little one can get alone with, not how much” (p. 30). “One is shedding not only clothes—but vanity” (p. 31). “I find I am shedding hypocrisy in human relationships. What a rest that will be! The most exhausting thing in life, I have discovered, is being insincere” (p. 32). “To ask how little, not how much, can I get along with. To say—is it necessary?—when I am tempted to add one more accumulation to my life, when I am pulled toward one more centrifugal activity” (p. 35). “Now, instead of planting our solitude with our own dream blossoms, we choke the space with continuous music, chatter, and companionship to which we do not even listen. It is simply there to fill the vacuum. When the noise stops there is no inner music to take its place. We must re-learn to be alone” (p. 42). “But if one says: I cannot come because that is my hour to be alone, one is considered rude, egotistical or strange. What a commentary on our civilization, w hen being alone is considered suspect; when one has to apologize for it, make excuses, hide the fact that one practices it—like a secret vice!” (p. 50). “But neither woman nor man are likely to be fed by another relationship which seems easier because it is in an earlier stage” (p. 68). “We Americans, with our terrific emphasis on youth, action, and material success, certainly tend to belittle the afternoon of life and even to pretend it never comes. We push the clock back and try to prolong the morning, overreaching and overstraining ourselves in the unnatural effort. We do not succeed, of course. We cannot compete with our sons and daughters. . . . In our breathless attempts we often miss the flowering that waits for afternoon” (p. 86). “We have so little faith in the ebb and flow of life, of love, of relationships. We leap at the flow of the tide and resist in terror its ebb” (p. 108). “We insist on permanency, on duration, on continuity; when the only continuity possible, in life as in love, is in growth, in fluidity” (p. 108). “The only real security is not in owning or possessing, not in demanding or expecting, not in hoping, even” (p. 108). “For it is not merely the trivial which clutters our lives but the important as well” (p. 115). “The best ‘growing ground’ for women, however, may be in the widespread mushrooming of women’s discussion groups of all types and sizes. Women are talking to each other, not simply in private in the kitchen, in the nursery, or over the back fence, as they have done through the ages, but in public groups. They are airing their problems, discovering themselves, and comparing their experiences” (p. 137). Yes, do! It is a quick but worthy read. Wow! I did. Thanks so much for sharing this! Oh good. That makes me happy. Thanks so much for sharing these quotes. What floored me was how relevant all her words are to us women today. “My mind reels with it. What a circus act we women perform every day of our lives. It puts the trapeze artist to shame” –> I was just thinking this very thought this week, especially in the context of technology, and how it makes us both freer and yet more constrained at the same time. “[Women] are airing their problems, discovering themselves, and comparing their experiences” –> Yes, especially through blogging now, where we can reach out and find solace in friendships with women we may otherwise never meet. Another book to add to my to-read list – thanks for this! You are welcome. I had the same thought as I was reading. Her words are almost sixty years old, yet they apply to us now. I love that you connected it to blogging, too. My mind went there as well, especially since I did some research on “mom blogs” last year. One of the main themes all of the women I interviewed mentioned was community, or the idea of connecting with other mothers and bloggers. Thanks for posting these, Emily! I agree with Cecilia — so relevant, even now. I struggle with the desire for permanency and I’m resistant to change. I might need to post this one somewhere prominent: “We insist on permanency, on duration, on continuity; when the only continuity possible, in life as in love, is in growth, in fluidity” (p. 108). Me too! Darn that fluidity. Why does IT have to be so constant? That was the biggest “problem”/lesson-learned for me when I had my first baby. Just when I had things figured out, she grew a little and changed a little. It drove me nuts! I couldn’t keep up. We’re still in the throes of that phase here (our son is 2); but we’re both trying to be more relaxed, less structured. I think it’s going to be a long process! I’m going to look for Gift from the Sea at the library! Hang in there! It does get better. It has been easier with my second one because I knew what is/was coming. Thank you for sharing these. Yes I agree with Celia and Carolyn. Very timely, very useful. Wonderful food for thought! It definitely seems her ideas are still timely. I, most relate to her ideas of shedding extra stuff/people/effort. “One learns first of all in beach living the art of shedding; how little one can get along with, not how much” And especially in relation to friendships, that insincerity is more energetically exhausting than sincerity. It seems I need to learn this lesson repeatedly. I will be looking for this little gem of wisdom on my next book hunt. It certainly is filled with wisdom. I was thinking of shedding in terms of material things, but your application of it to relationships is so true. I often feel like I’m not allowed to take any time to just be and do nothing by myself. I definitely believe the view that says I have to always be giving, always be sacrificing. Such wise words. Thanks for sharing! I love that part, too. So yes, give yourself permission to be alone. We all need time to recharge and to learn who we really are by being with ourselves. I read this when I was maybe 12 years old? I was underwhelmed. You were probably way too young to appreciate it. Even Anne said in the afterword that she reread it years after it was first published and realized how little she knew of the part about a woman’s life after her children are grown. Love the quotes you’ve shared — I’m going to have to get this. I wasn’t particularly drawn toward her works following The Aviator’s Wife but this post piqued my interest! It’s lovely/depressing how resonant, still, her sentiments are. Ha! Lovely and depressing both. Yes. Very nice change of presentation. Enjoyed the quotes. They were insightful and made me think. Thanks! I am glad that they spoke to you. I totally agree. I’ve been insincere for a while with some loved ones, and now, that I’ve been sincere, I cannot explain in words how much relief I felt. I’m gonna buy this book right now. I really wanna read it. I hope you enjoy it! It is nice to hear your experience with being more sincere. That is hard sometimes, especially when it comes to possibly hurting feelings. I need to work on that and being true to myself. You’ve no idea how hard was telling the truth of my life (that’s been a lie for the last 3 years) to my family, but even it was a hard hit, now we’re working together on how to get back to the right path. If you need some help or advise, I’ll be pleased to help on what I can. P.S. Got the book this morning! 😀 Can’t wait to begin it! Pingback: Literary Wives: The Aviator’s Wife | The Bookshelf of Emily J.